Summer is here, and there’s only one thing on our minds - vacation! And what better way to escape hot and sticky city life than visiting a treehouse retreat? 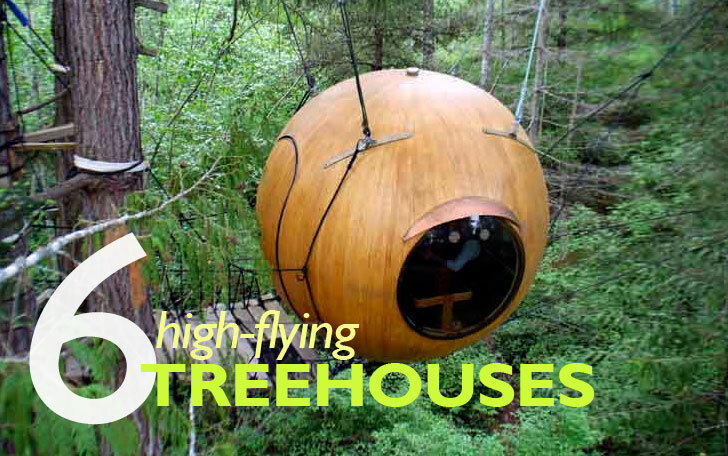 Part childhood fantasy, part all-natural oasis, these tree houses range from rustic to luxurious. Check out our gallery to see six of our absolute favorites - from Sweden's stunning Treehotel to Baumraum's elegant treetop retreat, Dre Wapenaar's raindrop-shaped Treetents, and the swirling Yellow Treehouse Restaurant. Head up to the Pacific Northwest and buy or rent your very own hanging treehouse that looks more like a place an Ewok or Jules Verne would call home. The spacey spheres, designed by Tom Chudleigh, are handmade from fiberglass and local woods. Strung up from neighboring trees, each pod can sleep up to four, and can be hooked up to an electric line. German Architects Baumraum are known for their extraordinary treehouses, and this one at World of Living is no different. Located in Rheinau Baden-Linx, Germany, this treehouse rests on spindly spider legs, almost 3 storeys above the ground. Inside, the vaulted ceilings are lined with giant oak leaf wallpaper, which emulates a tree canopy. Guests can relax on the rotating chairs, and take in the views of the park. Want more treehouse goodness? Check out the rest of our roundup here or by clicking through our gallery. you can see the interior. just click on the name of the tree house below, it will send you to more pictures. Visitors to Scandinavia can spend the night amongst the trees in one of Treehotel’s gorgeous treehouse rooms. Along with a TreeSauna, Treehotel offers six private guest treehouses in winter or summertime. Each of the six rooms was built by a different guest architect, making each entirely different. With respsect to Mother Nature, each room is outfitted with radiant floor heating, a state-of-the-art eco-friendly incineration toilet, and a water-efficient hand basin. Whether you want to dine in New Zealand, camp in British Columbia or sleep in luxury amidst the treetops in Sweden, there is a treehouse escape for you! If Swiss Family Robinson moved to the rainforest to start a town, they would likely create Finca Bellavista in Costa Rica. The sustainable arboreal treehouse community embraces rainforest living. Complete with private treehouses, dining hall, open-air lounge with Wifi, bath house, campfire ring and wedding garden, the complex is hardly roughing it. Connected by the “Sky Trail,” Finco Bellavista is an escape from city life that you are sure never to forget. German Architects Baumraum are known for their extraordinary treehouses, and this treehouse at World of Living is no different. Located in Rheinau Baden-Linx, Germany, this treehouse rests on spindly spider legs, almost 3 storeys above the ground. Inside, the vaulted ceilings are lined with giant oak leaf wallpaper, which emulates a tree canopy. Guests can relax on the rotating chairs, and take in the views of the park. Head up to the Pacific Northwest, and buy or rent your very own hanging treehouse that looks more like a place an Ewok or Jules Verne would call home. The spacey spheres, designed by Tom Chudleigh, are handmade from fiberglass and local woods. Strung up from neighboring trees, each pod can sleep up to four, and can be hooked up to an electric line. Spiral staircases wind around tree trunks to provide access into each Free Spirit Eco Sphere on beautiful Vancouver Island, British Columbia. 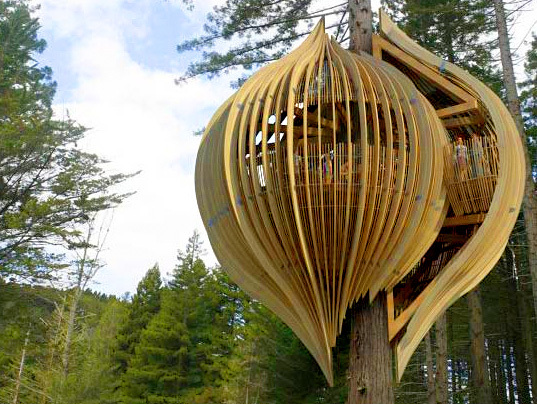 Like an enormous chrysalis, the Yellow Treehouse Restaurant in New Zealand is a gorgeous network of poplar and redwood slats, high above a redwood tree. A project of the Yellowpages (yes the phone book), the slatted sphere lets in 360 degrees of natural light into the interior of the café. Eighteen diners can enjoy the café at once, enjoying a birdseye view of a nearby stream while noshing. Soon, the space hopes to host private events and functions. Go a little rustic, and take your treehouse camping. Dutch designer Dre Wapenaar originally designed the dewdrop shaped Treetents for tree-sitting activists. But Treetents had appeal for the adventurous camper as well. They are constructed of a strong steel frame, canvas, and a hardwood sleeping platform with mattress in the interior. Hung from a tree, they keep campers off the ground during rain, while adding a little more magic to the camping experience. Treetents make their home at Hertshoorn in the Netherlands.